How To Make a Roux? It’s a question I get very often and for great reason. Anyone can make a roux, and if you read on, you will become an expert sauce and gravy maker in no time flat. Generally, a Roux is classified by one of three colors, and each has its unique character. Don’t let those fancy sauce names fool you though; a roux is also important in a good Mac and Cheese and that gravy recipe we all like to use on top of those mashed potatoes and turkey on Thanksgiving Recipes. 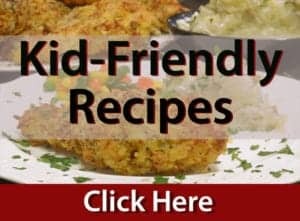 How To Make a Roux? When making sauces and gravies, unless thickened by a reduction, a thickening agent is needed. There are many options you can use. Roux (pronounced roo, as in kangaROO). 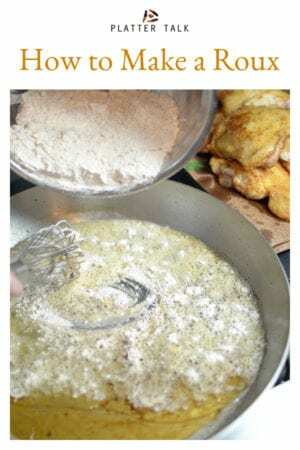 Learn how to make a roux from Platter Talk food blog. Today I am showing you how to make a roux. A roux is equal amounts of flour and fat, cooked together to make a binding thickener for stews, soups, sauces, and gravy. Fats that can be used include butter, drippings or oil. Once you’ve successfully made and used a roux a few times, you’ll be able to “eyeball” it, without measuring or weighing. 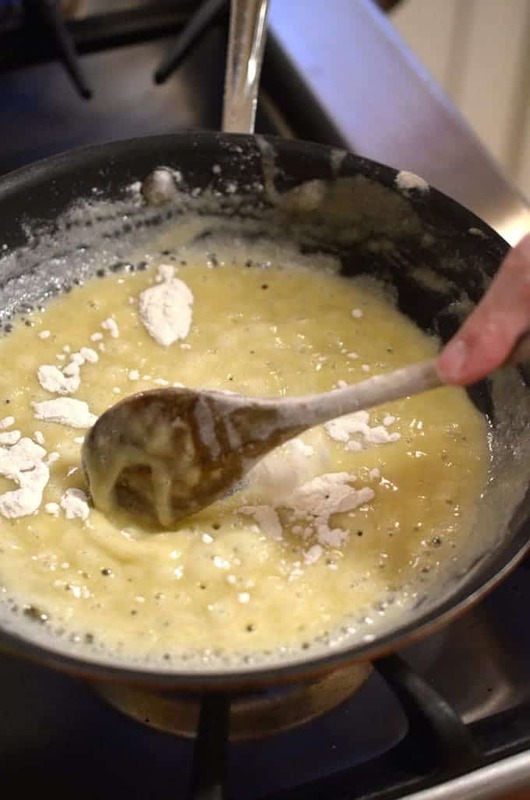 Look for the perfect ratio of flour and fat in a roux to have the consistency and appearance of wet sand. When making a roux, the flavor and color of a roux will change, the longer it is cooked. Generally, there are three colors of roux. 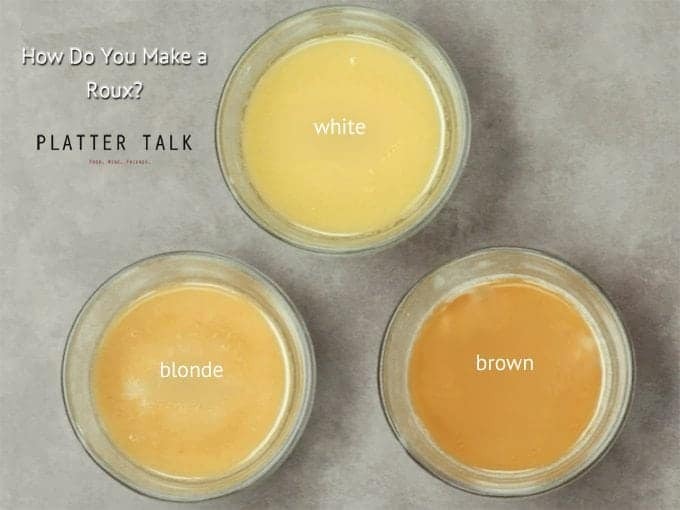 The color and flavor desired for your end product determine the color of roux that you need to make for your thickener. 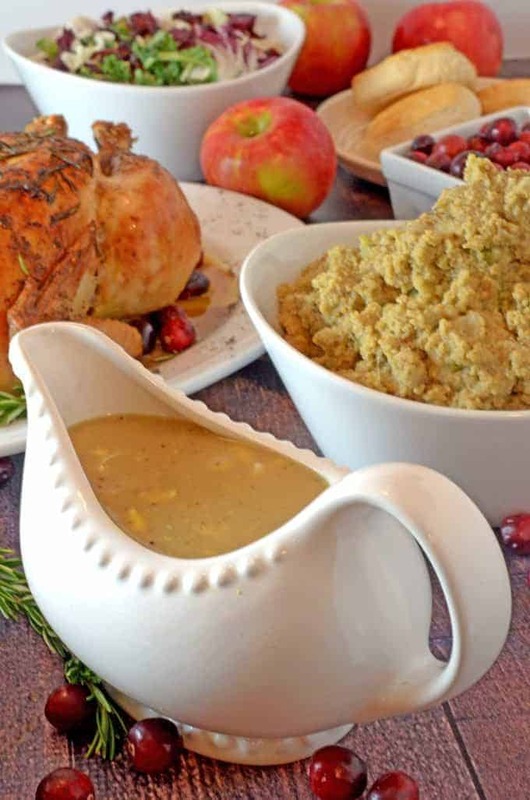 See our video of how to make a roux, with our Recipe for Giblet Gravy. When preparing a roux, it’s important to stir constantly (I use a wooden spoon) or whisk. 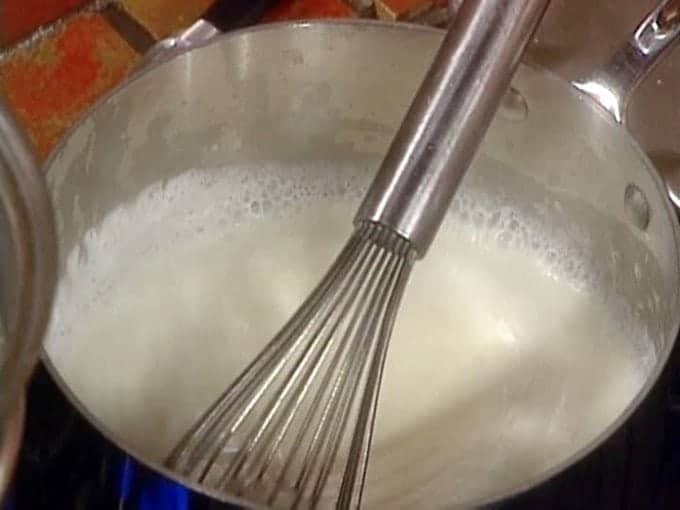 A white roux is cooked the least, no more then 5 minutes, so it remains light and is mostly used with a milk base (think Béchamel, one of the five mother sauces). Béchamel uses a white roux, for a lighter flavor. When making a blonde roux, the fat & butter is cooked out to a golden color, 5 to 10 minutes, taking a little more time to make than a white roux. Because of this, it will have more flavor than a white roux. Blonde roux can be used in chowders, bisques, gravy, and when mixed with stock, becomes a Velouté, another 1 of the five mother sauces. A brown roux is cooked between 10 and up to 30 minutes. Brown roux are great bases for meat gravies and are used as an ingredient in another mother sauce, Espagnole. As a roux continues to cook its flavor will deeper thus producing a more pronounced taste. 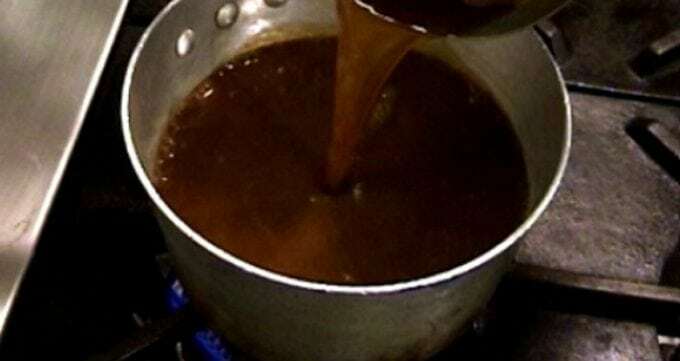 Dark brown roux is used in traditional gumbo. Another 10 minutes can be added on to the cooking time for this. This Espagnole is a classic brown sauce that gets its thickness from a brown roux. The darker the roux becomes, the less thickening ability it will have to receive liquids, due to the result of the chains in the gluten being altered by the deep cooking process. Therefore, plan on making extra when making a darker product. 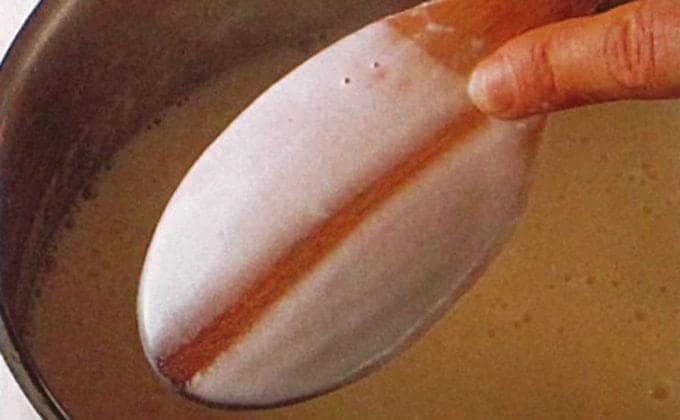 A flour-based sauce is the correct consistency when it coats the back of the spoon- this is called Nappé in French cooking. In a Nappé sauce, the sauce will coat the back of a spoon. 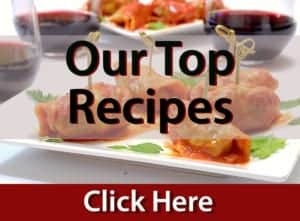 Here is a great link on 12 Classic Sauces Everyone Should be Able to Make. Pin these instructions for making a roux for later. Great tutorial and a must have for the Thanksgiving holiday. It takes some time to nail the perfect roux and you have certainly provided a great guide here! That looks delicious perfect roux is the base of lot of dishes. Your step by step simple way of explaining makes it more delectable. This was a great refresher to roux. I remember when I just started out the different sauces use to confuse me so much. This is good information. Thanks for sharing. Wonderful instruction for those who are uncertain how to go about making delicious sauces. Once you get the hang of it making gravy and any sauce is a breeze. Very important to know. You are a genius! You explained everything so easily. This is a really great instruction, and I understand everything. Holidays are approaching and your post will definitely be useful to me. Thanks for the informative post! My cooking changed in an instant when I started making roux to make gravies and sauces. Such a simple technique with amazing results! This is such an informative post with great photos! I’ usually use butter and flour, but really need to start experimenting more! One of the basics of cooking … that so many people these days just don’t know. Beautiful photos, too, showing the differences between the three versions. This is a great resource to bookmark. I regularly make a roux while cooking, but didn’t know they had different names! I have to keep all these on hand! Great idea! That looks so easy to make! Would love to try it! Such a fantastic guide!! The roux looks incredible!! This is such great information! I know when I started cooking, I had to google what a roux was, and then watch a video on how to do it – so this is super useful! This is an amazing guide! This is such a helpful guide for making a roux. This post is timely since the holidays are quickly approaching. This is such a fantastic breakdown of instructions! 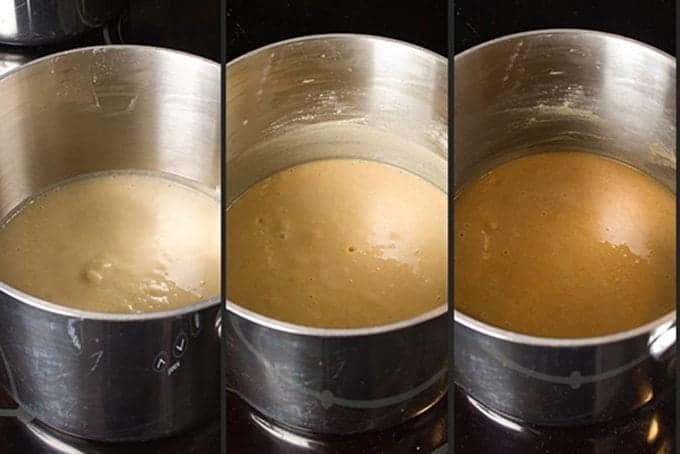 Knowing how to make a roux is so important and you just made it so easy to understand! Thanks, Meghan; we’re glad you like this post! Thanks so much for all this info! I admit my roux usually has lumps. I don’t have the patience to make a smooth one most of the time. Bintu, you are most welcome. Thanks for reading the article! That looks creamy and delicious and perfect for the upcoming holidays. I am going to give it a try. I hope that it helps you make whatever you decide to use it with! Great instructions to help out roux beginners! They are so helpful in making soups and sauces! Thanks Christina. I’m glad that you enjoyed the post.